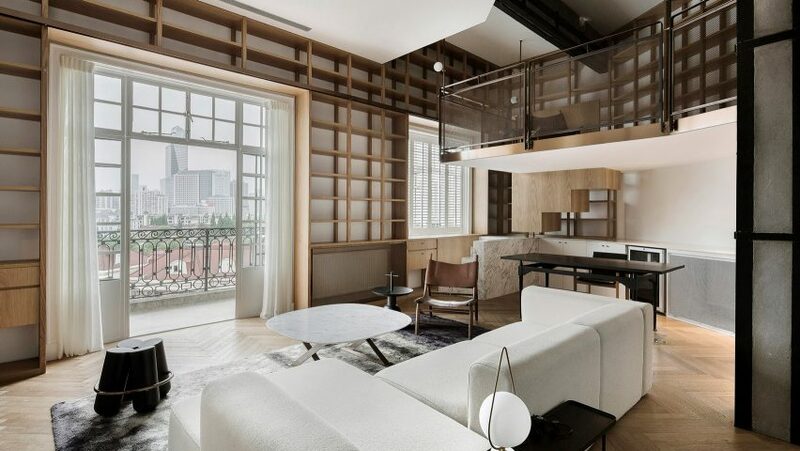 Atelier Tao+C has renovated a top-floor apartment in one of the earliest high-rise residential buildings in Shanghai, adding bookshelves all around its perimeter. 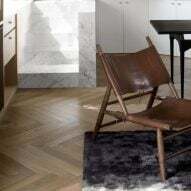 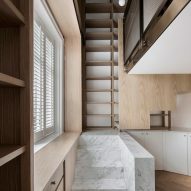 The renovation sees the 95-square-metre, one-bedroom apartment turned into what the architects call one enormous "study room or home library". 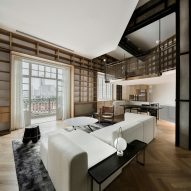 The flat sits within the ISS Normandy Apartments, designed by the Hungarian-Slovak architect László Hudec in 1924 and located in the former French Concession area of Shanghai. 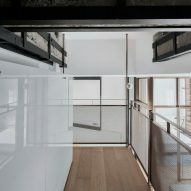 In contrast to the conventional Chinese apartment layout where the living room and bedroom are regarded as the most important spaces in the home, Atelier Tao+C's plan revolves around the study. 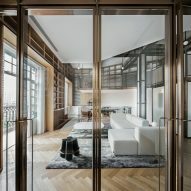 The architects removed all of the interior partition walls to create an open-plan layout and installed double-height floor-to-ceiling smoked oak bookshelves around the apartment's perimeter. 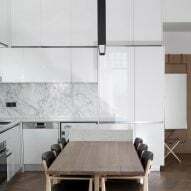 They also inserted a small mezzanine level to the left of the compact kitchen and dining table. 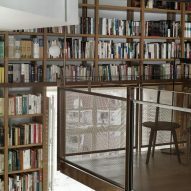 A narrow set of stairs leading to it is wrapped with a light bronze mesh handrail and more bookshelves. 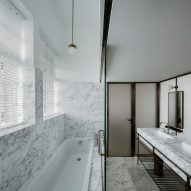 To create the extra height, it was necessary to expose the building's concrete and steel beams, which are supported by an exposed concrete and steel column in the apartment's centre. 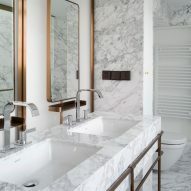 The living room takes the form of a modular sofa in the centre of the apartment, while a white marble bathroom is tucked beneath the mezzanine level accessed through a bronze frame door fitted with translucent glass. 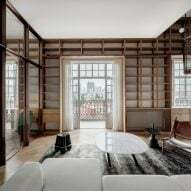 Located just off the living room area, the bedroom is separated from the rest of the apartment by a wall of pivoting bronze frame glass doors that can be opened up to merge the bedroom into the main space. 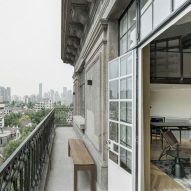 A set of original French doors open out onto a 12-metre-long terrace on the north-west side of the apartment that overlooks the city's former French Concession area. 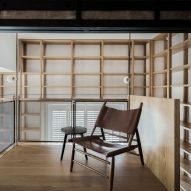 Other architects using floor-to-ceiling bookshelves in residential interiors include Studio MK27, who installed grids of wooden shelves across double-height walls inside a luxurious apartment in São Paulo.